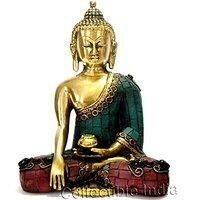 Antique Finish Brass Sitting Medicine HealingBuddha Statue Amulets Medicine Buddha medicine Mudra is translated as Touching the Earth, or Calling the Earth To Witness the Truth mudra. This hand gesture is always depicted with the right hand, while the left hand is on the lap, with the palm facing outwards (Varada Mudra). Enhance your home,garden and office by this graceful brand vintage Finish of Buddha Statue The Buddha is draped in an antique turquoise gemstone robe falling gracefully about his crossed legs. The green turquoise and tiny mirrors on the robe superbly the statue. The practice of Buddha is a very powerful method for healing ourself and others, and for overcoming the inner sickness of attachment, hatred, and ignorance. If we rely upon Medicine Buddha with pure faith we shall definitely receive the blessings of these attainments Material: Base material is Brass Metal. Green Turquoise gemstones used extensively with other fine Multicolor genstones. Theme: Antique Finish. Size: Perfectly Large 8 Inch Height Weight: Heavy; 2 KG Total Weight with Packaging: 4+ KG (Approx) Background of the product & Stone: The turquoise stone is rare and valuable in finer grades and has been prized as a gem and ornamental stone for thousands of years owing to its unique hue. Since at least the First Dynasty (3000 BCE), and possibly before then, turquoise was used by he Egyptians and was mined by them in the Sinai Peninsula, called "Country of Turquoise" by the native Monitu.